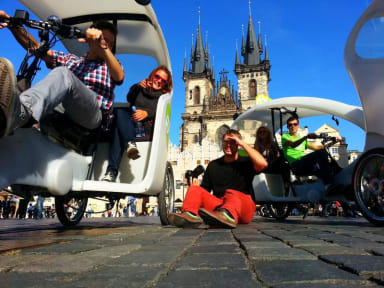 Hostelworld guests have said 'the location couldn't be any better' at Prague Square Hostel. It's set next to Old Town Square and the Astronomical Clock in Old Town. This hostel is a good option for those on a budget as its central location means guests have little need for trams or taxis to get around the city. Our visitors have said the staff are 'very friendly and helpful with any and all questions, [they take] the time to point things out on the map and [make] a free breakfast and sandwich every day'. Nice hostel right in the middle of the square. Only downside is that the stuff in the square is more expensive then most if the city. Free breakfast in the morning was sustaining enough, just cereal. Cons a bit tight in the rooms, but beds are comfy enough. Overall: Loved it! Absolutely Great! Would stay again! Pros: Super friendly staff, like home away from home, great location, activities for all (free walking tour, pub crawl, castle tour: ask inside), super helpful staff with all questions Cons: There was one men's and one women's toilet in my floor. However, the toilet issue was all through Prague. The metro station only had 2 and many bars and restaurants only had one. Be prepared to wait a few minutes or use the men's. A very old building that feels like a summer camp vibe. However they keep it quite clean and the beds were very comfortable. The location is perfect, right in the middle of everywhere you would want to go (all in walking distance). Would recommend to everyone that is not thrown off by older/less renovated buildings. This hostel had excellent security and staff. The location is a short walk from many large tourist points in Prague. The male toilets were a tad small but the showers had hot water every time. The provided breakfast had some incredible granola/cereal- highly recommend that one capitalizes on the breakfast! I had an issue with pick pockets while in Prague but the staff at the hostel did everything they could to help me, even letting me use a personal laptop because the computers were down. Rooms looked a little ragged and concerning, but it ended up being okay for one night. The hostel was extremely well located. Walking home at night felt safe. Although the 10 person room was a bit cramped, it did the job. The lockers were spacious and comfortable. Breakfast was simple but a nice added bonus. An amazing deal for the money! The hostel is located very close to the old town square. In case you plan to stay here, you probably would not need a complete day pass of the public transport because most of the attractions are in walking distance from the hostel. The facilities are pretty standard and we found the hostel to be clean and comfortable. They offer breakfast as well and would ask you to pick up sandwiches from reception in the morning but you would need to go early and get your sandwiches before they run out. Comfortable stay. Value for money. Prime location. Walkable access to most of the popular attractions. Friendly staff. Decent breakfast. Great location and safe. I went there with a friend, so it was nice. If you want to meet other travelers, it`s probably not the best hostel for you. The living room and kitchen was almost always empty, not a typical hostel- atmosphere. Some of the staff were really kind & open, one guy seemed a bit pissed and not at all motivated. This is a very culturally and historically rich area, and one of our most unique aspects is that we're in a historical building with the Old Prague legends on the walls.